Freckles passed away this morning. None of us really feel like talking about it yet, but we thought we should at least post something to let everyone know. This is a rather old photo, but it shows her in her favorite place in the house. 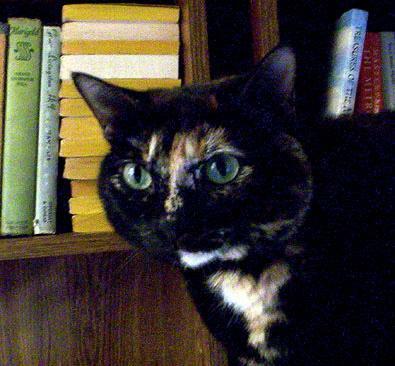 hugs to all you kitties and you peoples- it was months before i could talk about it when i lost my satine. Thank you for your kind words. We love all of our cats so much, they really are a part of our family and it hurts a lot when they are gone. I’ll use my extra-cat-estrial powers and get a message to Bob to watch out for Freckles at that place where loved pets go. We are very sorry and send you lots of purrrrrs. Thank you everyone. Her special corner of the living room seems so empty.